The excitement is mounting! 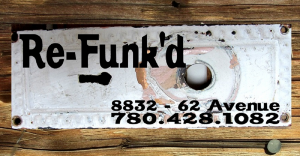 We’re so excited about launching Re-Funk’d, we can’t stop talking about it! Re-Funk’d is going to be a boutique within the Home Re-use-ables shop offering vintage, salvage, and unique recreated goods and materials. Basically that means we’re offering up salvaged goods that have been tweaked into a new level of awesomeness so you can skip that whole pesky crafting business! Of course, if you like that pesky crafting business, we’re going to offer unique supplies and materials too! So now that you know, you’re probably wondering “when”… Not soon enough I can tell you! Our crew is working hard and early to mid April, we should be ready to rock. See you soon!